Yes, this is my town. It's not new to you. You've read books about it, you've seen movies. People are always talking about New York. It's the most exciting city in the world they say - the most glamorous, the most frightening and, above all, the fastest. You hear a great deal about the tempo of this city - its speed, its pace, its driving heartbeat. Perhaps it's true for visitors, but I was born here, I live here. The only pace I know is the pace of my own life. The only beat I hear is the beat of my own heart. For me, and for millions of others, New York is home. The days follow each other quietly as they do in most places. Only rarely does any one time stand out so that we remember it and say "That's when everything changed. After that nothing was the same." 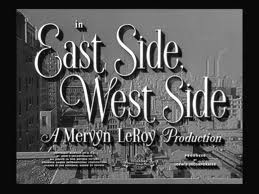 Barbara Stanwyck as the character Jessie Bourne reads the above narration to begin Mervyn LeRoy's 1949 crime romance East Side, West Side based on a Marcia Davenport novel with a screenplay by Isobel Lennert. I am one of those visitors Jessie mentioned. For me, New York City is a place of learning, a place of fun, a place to glut myself on theatre and a place to honeymoon. All of those memories are augmented by those books and movies she mentions, the titles of which conjure up enduring feelings that make New York City an emotional home to many who reside outside its boundaries. Classic movie fans were brought up in the nostalgic glow of Henry King's Little Old New York and Michael Curtiz's Life With Father, with Raoul Walsh's The Bowery and The Strawberry Blonde. We learned harsh lessons through William Wyler's Dead End and Michael Curtiz's Angels With Dirty Faces. We enjoyed and were inspired by the endless show business stories such as Lloyd Bacon's 42nd Street and Robert Mulligan's The Rat Race. We glimpsed the business world in Jean Negulesco's The Best of Everything and Woman's World, as well as Billy Wilder's The Apartment and Fielder Cook's Patterns. We reveled in NYC noir of Otto Preminger's Laura, Alexander Mckendrick's Sweet Smell of Success and Samuel Fuller's Pick Up on South Street. Of course, to the annoyance of sports fans from other cities, there is the New York as centre of the universe in movies like Sam Wood's Pride of the Yankees. Any place, but especially a place like New York City, changes us and changes with us. Neil Simon gave us his optimism in Barefoot in the Park, laughs in Come Blow York Horn and The Odd Couple, memories in The Sunshine Boys and nightmares in The Prisoner of Second Avenue and The Out of Towners. In East Side, West Side Jessie Bourne spoke of the one time that changed everything. Ten years since the September 11 terrorist attacks on the World Trade Centre have brought changes to each of us personally, and to the world we live in. What has not changed is the resilience of New Yorkers and the affection and support from those of us with mythical ties to the city that never sleeps. Caftan Woman - thank you SO much for remembering my "town" as we look towards the tenth anniversary of a day we will never forget. NYC is truly an endless source for all that is good, bad, wrong, right, beautiful, ugly, joyous and sorrowful. Big hugs to you. I return a special hug to you, Marsha. Caftan Woman, as a native New Yorker who lived in NYC on September 11th, 2001, I was moved and misty-eyed as I read your beautiful blog post commemorating tomorrow's 10th anniversary of this life-changing event. Thanks for your wonderful tribute! Thank you, Dorian. I hoped that the depth of my feeling would be understood. Lovely, and gracious beyond words. I appreciate that very much, Jacqueline. That was a wonderful post. Thank you for sharing. I'm embarrassed to admit that I'm nearing 50 years old and have never been to NYC. I do plan to rectify that in the next couple of years. I know I will love it. Thanks again for sharing that with us. Becky, your kind thoughts mean a lot to me. Kevin, you will have a great time in NYC!